Kira Q Tech, developer of the popular KQ Dixie and KQ MiniSynth, released MIDI Recorder with E.Piano. With the app you can record a MIDI sequence as a MIDI file, and then play it back on any MIDI device. It also has it's own built-in FM synthesizer for FM Electric Piano timbres. MIDI Recorder with E.Piano is completely free, and if you like it you can donate. MIDI Recorder with E.Piano simply performs record/playback as you input MIDI signals. 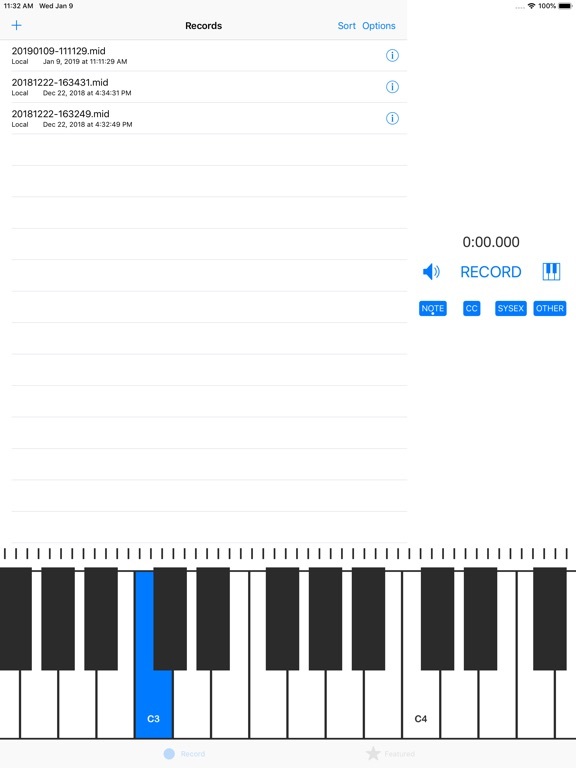 When connecting an electric piano, organ, or keyboard to your iPhone/iPad, you can record the performance completely. As a bonus, the app includes FM E.Piano sounds. Also there is an on-screen keyboard, you can make a note of your idea anywhere. - You can toggle kinds of signals to record. - You can select MIDI channels. - The app processes signals from all MIDI ports. You can not select ports. - The app makes files of Standard MIDI File Format 0. - iTunes File Sharing and iCloud are supported. MIDI is a standard about controlling audio devices. You can control musical instruments with separately sold MIDI adapter for iPhone/iPad. The internal FM synthesizer processes only note on, note off, and sustain control, and ignores the others. This app may sound even if the device is silent. I don’t wish to be rude but whoever is naming their apps should be uh.... gosh can the names get any more boring? This looks like it could be immensely useful. I've been wanting a MIDI recorder for iOS for ages.